Purchasing Or Hiring A Jumping Castle For Your Church, Ministry Or School? In recent times the popularity of jumping castles and other such inflatable equipment for use at a wide range of church and ministry events has increased. Whilst many organisations will opt to hire jumping castles from third parties, as this type of equipment becomes more affordable, we have noticed a trend where churches are seeking to purchase their own inflatable equipment for use in their programs, at wider community events or to make available for hire to the general public. Often organisations have committed to their purchase of a jumping castle before considering the responsibilities they will need to comply with from a work place health and safety perspective, legislative requirements governing the use and operation of such equipment or perhaps whether their Public Liability Insurance will even cover the item at all. Important factors you need to be aware of when purchasing or hiring jumping castles and inflatable amusement devices. Jumping castles and similar devices, when operated correctly can be both a safe and enjoyable experience. However, the use of such equipment does carry some significant risks. In September 2017, a child sustained serious injuries when a jumping castle became airborne. The child was playing on the inflatable amusement device when a sudden strong gust of wind lifted the front of it up whilst it was secured at the back to a fence. The child fell from the device to the ground. The jumping castle had been set up on a netball court and had only been secured on one side. (source Worksafe.qld.gov.au). In another incident, in December 2005 a two-and-a-half-year-old boy suffered partial amputation of his finger when he placed his hand into the exposed area of the fan used to inflate a jumping castle. The castle had been set up at a Christmas event, and the operators did not appropriately supervise the activity. Jumping castles and other inflatable equipment used for commercial purposes must adhere to Section 2.1 of Australian Standard 3533.1 – 2009. Australian Standard 3533.4.1-2005 specifically deals with land-borne inflatable devices. This standard governs the manufacture, design, operation and maintenance requirement of inflatable amusement devices such as jumping castles, gladiator courses and the like. Jumping castles which can be purchased for private use and are identified as “toys”, are not subject to this Standard, however it is important to note that the same level of care would still need to be employed when using them. Work Safe recommends that the Australian Standard is applied to all jumping castles and inflatable devices that you may wish to use in your programs. Be wary of cheap overseas imports which may not comply with these requirements. Some amusement devices are required to be registered. In some states of Australia each individual jumping castle is required to be registered every year. Equipment purchased in Western Australia, South Australia and Queensland, should be provided with a copy of the design registration certificate. Schedule 5 of the WHS Regulations stipulates the types of devices requiring registration. N.B Inflatable devices (continuously blown) means an amusement device that is an inflatable device that relies on a continuous supply of air pressure to maintain its shape. Platform height means in relation to an inflatable device (continuously blown), the height of the highest part of the device designed to support persons using it (the platform) as measured from the surface supporting the device to the top surface of the platform when the device is inflated but unloaded. Churches and ministries, who choose to purchase their own jumping castles, increase their liability responsibility as they are also assuming the responsibility for the safety of the equipment itself. In this instance, stringent maintenance programs are vital towards ensuring the equipment is in good working order. It should be noted however, that the ACS Insurance/Protection Programs are not designed to provide liability protection for this type of equipment being made available for hire or loan to other groups or individuals. Contact our office if your organisation wishes to utilise their equipment in this way on 1800 646 777. When hiring jumping castles, there is an onus both on the person hiring the equipment and the person it was hired from to ensure that the equipment is safe to use. • The equipment being hired is suitable for its intended use. • That the hirer has appropriate Public Liability Insurance over their equipment. A Certificate of Currency from their insurance provider will suffice. (inspections, testing and maintenance should be recorded in a log book). use of and pack down of the equipment is provided. As with any activity you undertake in church, completing a Risk Assessment for your program is one of the first steps taken prior to running your event. This process will allow you to identify potential hazards, who might be harmed and how, the likelihood and possible consequence of such a hazard occurring and then steps you can implement to avoid or reduce the risk eventuating. Click Here For The Example Risk Assessment For Jumping Castles For Church. Click here to download a blank Risk Register and Treatment Form (Risk Assessment Template). Supervision of participants on an inflatable device must be by a competent adult over the age of 18 years of age. The supervisor must be in attendance at all times during the use of the equipment. Ensure that manufacturers guidelines are adhered to in relation to number of people to use the equipment at any one time, or weight restrictions. The supervisor must ensure that an appropriate mix of persons only participate at any one time. Ensure participants are matched in weight or age. This safeguards against larger participants falling and injuring smaller ones. The supervisor is responsible to monitor and manage appropriate behaviour of participants on the amusement. This would include no rough play, somersaults, backflips etc. In the event of high winds being apparent, the inflatable amusement is to be cleared of patrons and fully deflated. Make sure that participants remove shoes, belts, glasses, jewellery or any other item which may cause damage to the inflatable equipment. Children under 3 years of age are not permitted on the inflatable without adult supervision. No acrobatic manoeuvres or rough play allowed. Bouncing on the step or near the entrance is not permitted. Shoes, belts, jewellery and glasses must be removed prior to entry. On slides, go feet first and in a seated position only. One rider at a time. People with head, neck, back or other muscular-skeletal injuries or disabilities,pregnant women and others who may be susceptible to injuries from falls, bumps or bouncing are not permitted to use the equipment. Churches and ministries, who choose to purchase their own equipment, increase their liability responsibility as they are also assuming the responsibility for the safety of the equipment itself. In this instance, stringent maintenance programs are vital in ensuring the equipment is in good working order. 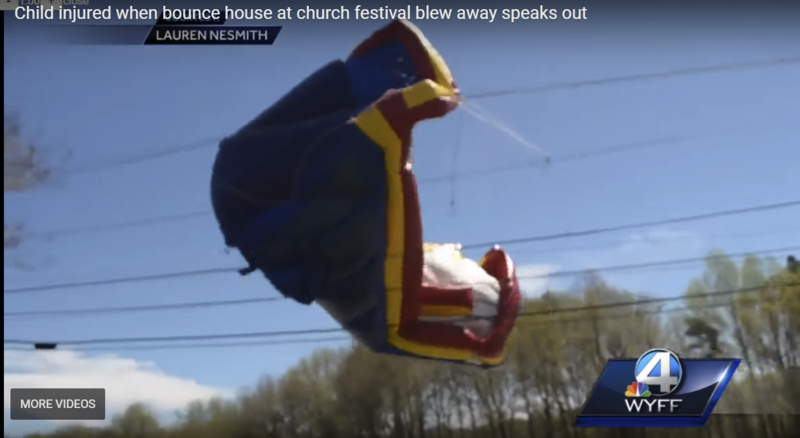 It should be noted that the Church Insurance/Protection Programs provided by ACS Financial will not provide liability protection for jumping castles (or other inflatable devices) being made available for hire or loan to other groups or individuals. Please contact our office if your organisation wishes to utilise their equipment in this way as it may be necessary for you to obtain separate insurance to cover this type of risk. Jumping castles can be a great draw card in attracting people to your programs and events. This increased interest creates a higher degree of risk and responsibility on your part to ensure the safety of your people and those who engage with you. Sound risk management, responsible supervision, routine equipment maintenance and appropriate insurance of your equipment will go a long way to preventing loss or injury, and a successful event for your organisation. DISCLAIMER: The information on this website reflect some of the commercial aspects and potential risks/obligations for your Church or School. The information is given as a guide only and does not represent a definitive list or legal view in any way shape or form. You are advised to seek your own professional advice on all your individual needs. Want to PROTECT your Church, Ministry or Christian School? Hi there, we're ACS Financial - Insurance and Protection specialists for Australian Churches, Ministries and Christian Schools. Need Help With Insurance and Protection? "The expertise and advice provided by ACS Financial, and the funding and insurance cover that they secured for us at great rates and terms, enabled us to fund and complete the development of our new Melbourne City campus. I would highly recommend you contact the team at ACS Financial"
Find out why thousands of Australian Churches, Ministries and Christian Schools trust us with their insurance and protection needs. The only question is, when will you?